Louis Cinquino is a writer, runner, Dad, channeler of bad poetry, itinerant pick-up basketball player and prodigious mulligan taker. 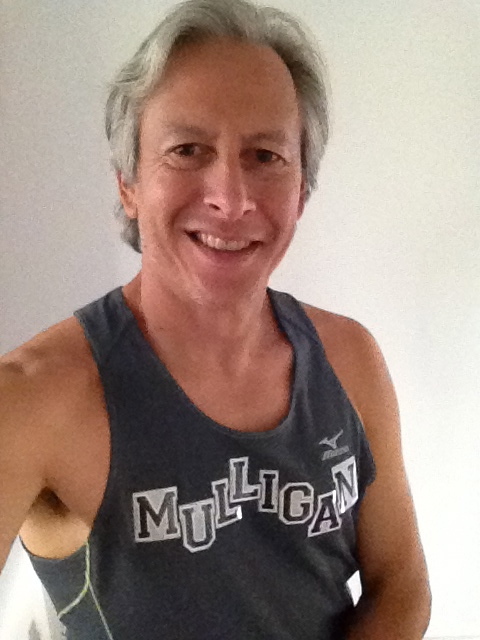 He began thinking about the power of the mulligan as he was training for The Fifth Avenue Mile in 2012. His personal observations, discoveries and training plan were featured in the September 2013 issue of Runners World magazine in The Mulligan Mile. He is best known as a direct response advertising writer whose work has been sent unsolicited to the mailboxes of tens of millions of English-speakers worldwide. If you are interested in health, fitness, gardening, running, bicycling, men’s health, cooking, quilting, sewing, vitamins, sexual health, home remedies, weightlifting, pet flatulence, home hints, diabetes, herbal healing or nutrition, then you’ve probably thrown out some of his best work. The author’s running career is completely without distinction or noteworthy achievements, unless you want to count finishing 23rd in the 1979 Genesee County (N.Y.) Cross Country Championships. He did accumulate a few cherished ribbons and trophies in his high school running career, and served as captain of the Notre Dame High School (Batavia, NY) track team. But his goal as a middle-distance runner, to break 5 minutes in the mile, was never met, and the circumstances of that disappointment form a foundational element in this story. He’s not an elite athlete. He’s more the guy you meet to run with on Sunday morning because you like to talk to him when you run. Not too fast, not too slow. Cheerful, smart, reassuring, never boring. Mr. Cinquino was raised in a deeply religious home and was educated through 13 years of Catholic school prior to his attaining his B.S. at Syracuse University and M.B.A. from University of Rochester. He remains a practicing Catholic engaged in the pursuit of awareness and mindfulness through Buddhist teachings learned through retreats with Vietnamese monk and best-selling author Thich Nhat Hanh and the His Holiness the Dalai Lama. His interest is in sharing some of what he learned through his spiritual and personal journey, but with an everyman’s voice and the vocabulary of running, not religion. His voice is of a regular guy who has stumbled into an unexpected divorce and in so doing, found a few answers and many more questions. Without preaching or making himself a victim stuck in the adversity of his life, a strong yet vulnerable new voice emerges to give readers a glimpse of what may be possible in their own lives. He resides in Bethlehem, PA, and can be reached at TakingMulligans@gmail.com and via twitter @louiscinquino. Taking Mulligans is a place where you can join us to keep asking the same question. What if we ran like there was no tomorrow and lived today like there was no yesterday? Together, we look for ways to move forward with new adventures and capture the excitement that can only be lived now. We share the emotions that lift us, try to understand what confuses us and together, we find ways to make the best of the life we find ourselves in. Mulligan is a golf term that represents a shot taken to replace one that has gone so awry that your playing partners allow you to hit again without penalty. The term’s origins are still debated in sporting circles. We don’t really care about all that, as long as we can take mulligans wherever and whenever life grants them. In fact, we don’t just take mulligans, we live the mulligan, constantly working to appreciate what is in front of us and remain aware of all life has to offer.